Includes unlimited streaming of Udopeia - The Remixes 2LP 2017 via the free Bandcamp app, plus high-quality download in MP3, FLAC and more. The acoustic debut album Udopeia created by the band Pilots On Dope was issued by Verve Records in June 2014. The sound has its roots in Brazil’s broad-ranging musical traditions, including Bossa, Samba and Afro Brazil, and evoking the golden age of the sixties. Consequently, the album went on to serve as the starting point for well-known mixers from the Pilots On Dope milieu.Taking this development to a second stage, Udopeia – The Remixes is aimed at an audience accustomed to electronic beats but also with an interest in musical reflexes and retro influences. The new remix album cleverly covers this musical spectrum, from exotic Latin sounds through to contemporary electronic remix culture. In the world of electronic music, Richard Dorfmeister has left countless traces. Since the mid 1990’s, the Vienna born artist, flute player, producer and DJ has released classic tracks and remixes with his co-partner Peter Kruder as ‘Kruder and Dorfmeister’. Records by Kruder and Dorfmeister such as the ‘G-Stoned EP’, on their own G-Stone Label, as well as the seminal ‘DJ Kicks’ mix-compilation for K7!, and the ‘K&D Sessions’ remix compilation are considered timeless masterpieces. Nowadays, he is gaining immense recognition with his new project ‘Tosca’. Gü-mix is the co-founder of legendary ‘Dub Club Vienna’. As a real aficionado, he has been frequently touring with his DJ-sets through Brazil, starting from the mid 80’s until today. 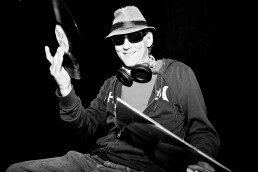 His DJ career spans over 30 years, still spreading youthful spirit and passionate enthusiasm behind decks. He covers an enormous spectrum of styles from from Deep, Minimal, D’n’B, Dubstep, Future Bass to Rare Groove, with a continuing/ongoing guarantee for furious crowds on international dancefloors. Producer and DJ Markus Dohelsky, aka Shanti Roots, has played an important role in Vienna’s electronic music scene since the 90’s. His groovy bass and captivating beats determine his productions, DJ sets and legendary live acts – from Blues, Cumbia, to floating Techno and House tracks. He worked with artists, such as Stereo MCs, Joyce Muniz and Louie Austin, and is actively composing for various movie- and theater productions. The Vienna Electronic movement, popular in the nineties, was a counterpart to the Nu Jazz movement which was emerging in Germany at the same time, and itself strongly influenced by offshoots of Acid Jazz. During the epoch-making close of the long-lasting Acid Jazz trend, a series of producers became established in Germany and England, drawing on elements of Latin, Brazil, easy listening, jazz and soul, and creating a veritable boom which went on to influence and inspire producers in Italy and France. Their Austrian equivalent was certainly the Vienna Electronic movement which triggered a literal downbeat cult, creating a distinctive genre with its striking funk riffs. Sampling, a by-product of Hip Hop, was certainly a key element in the resounding success of Kruder & Dorfmeister, the pioneers of Vienna Electronic. Despite the reduced tempo, this trend would conquer the dancefloor, generating its own identity and a musical code - light and raunchy, underpinned with an atmospheric soundscape, and overlaid with a pulsing rhythm in the heartbeat of flickering sound densities. Makossa & Megablast is the collaboration between Marcus Wagner, known for his legendary shows on Vienna’s FM4 radio station, and his long-time friend and producer Sascha Weisz aka Megablast. They teamed up in 2007 to release their debut album ‘Kunuaka’ on the infamous label G-Stone. In 2010, their highly acclaimed Ibiza anthem ‘Soy Como Soy’ was released with remixes from DJ Koze and D-Nox & Beckers, followed by the analogue titled second album in 2011. 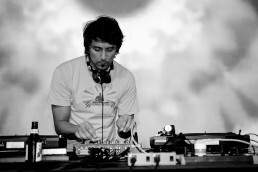 Further remixes and releases for labels, such as DJ Hell’s International DeeJay Gigolo, Compost Records, Man Recordings, as well as contributions to around 50 compilations helped spreading their work. In recent years, Makossa & Megablast have travelled the world with tour support by various vocalists and percussionists. Their musical direction, defined as ‘Electronic meets Organic meets World meets Dance’, with styles ranging from Afro/Ethno, House, Techno, Dub, Disco, Broken Beats and Hip Hop creates an ambience with walking ease. The versatile Viennese Stefan Mörth has been described as a ‘Renaissance Man’ and shows some remarkable talents. As a musician and producer, he is known as ‘Stereotyp’. With countless releases through renowned Viennese label G-Stone. Special recognition should be awarded for his collaborations with legendary Wutang Clan, Buraka Som Sistema and Diplo, among others. In addition, he shapes sound designs for Hollywood flicks by none other than Roland Emmerich. As a painter and illustrator he created numerous cover artworks, recently for Moodyman’s K7! DJ Kicks release in 2016. Pilots on Dope is a collaboration of Viennese DJs and producers Gerhard Gigler and Gerald Tomez. The two fellows shared their musical tastes for a long time, sharing decks together in various clubs, before teaming up in 2010 to create the Austro-Brazilian collaboration project ‘Pilots on Dope’. Their debut Album ‘Udopeia’, released on Verve in 2014, contains an interpretation of classical Brazilian repertoire from the late 50’s to mid 70’s in contemporary arrangements. The result is an entirely unique sound, the inherent fusion of retro and contemporary arrangements to create an independent sound aesthetic. It includes vocals from famous vocalists Wilson Simoninha and Rosalia de Souza. On the Remix album, the Pilots draw on their electronic roots with a floating Dub version of ‘La Vem Salgueiro’. The remix project brings together a wide range of producers who made history with Vienna Electronic, in particular past master Richard Dorfmeister and artists from his G-Stone label including Stereotyp, Makossa & Megablast and Gümix. They are joined by fellow remixers such as Shanti Roots and the Pilots Gerald Tomez (Vienna Scientists) and Gerhard Gigler (DJ Bunani). The newcomers Shantisan, Ksawa and Corrado Bucci from Brescia bring with them promising credentials and refreshing contributions. Enriched with further remixes by well-known producers including Rainer Trüby (Freiburg), Farrapo (Bologna) and Trotter (São Paolo), the result is a magnificent cross-section of remixes which have found their ideal home on the ultimate Verve label. ‘Truccy’ was formed in 2014 by young Italian producer talent Corrado Bucci of Rebirth Records, together with veteran DJ & Producer Rainer Trüby, well known for his project Trüby Trio. They shared common musical ground, ranging from Jazz, Brazil, Soul, Funk and Disco to Deep House and various electronic styles. Their decision to join forces came easy. After their first EP ‘Sidestep’ on German Compost Records in 2015, they have been kept busy with various remixes for acts like Alma Negra, Gilles Peterson’s Sonzeira project, Floating Points and an exclusive track for Kon’s new ‘Kon & The Gang’ compilation for BBE Recordings. When you talk about the Brazilian ‘Groove scene’, one of the most prominent names that comes to mind is Rodrigo Ulson aka Trotter. His uncanny ability to create and combine tropical vibes with NuJazz, Funk and Disco, have made him one of the few artists able to create the perfect ambiance for clubs, and festivals, with powerful beats, mesmerizing grooves and a ﬂawless execution. Over 100 releases on several labels such as Timewarp Music, Super Hi-Fi Recordings, Fort Knox Recordings, Tru:Funk and Royal Soul Records. 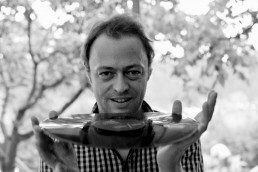 Herbert Bachhofer aka Shantisan founded his own musical platform and party line ‘Salted Soul’ in 2002. He started remixing in 2005, with Jorge Ben’s ‘Oba La Vem Ela’ (Jazz Records/UK), following project S.O.S with his partner Stefan Obermaier (Vienna Scientists) in 2008 and a release on New York label ‘Sol*Selectas’. Alongside his album ‘Conexão’ in 2014 he released several Broken Beat tunes and remixes for artists like Chacho, Ed Royal, DJ Farrapo, Quincy Jointz, amongst others. Besides he is hosting the popular radio show ‘One Note Samba’ on Vienna’s ‘Superfly FM’. oor rhythms such as Drum’n’Bass, Break Beat, House. His music has been released by several labels and selected for well know compilations like ‘Hotel Costes 11’, ‘Brazilectro 10’, ‘Sambass 4’, and many more. His 2010 album ‘Swingy Mama’ has become an Electroswing classic. This was followed by the Electrobrasil album ‘Alien Na Favela’ and various EPs and remixes. es with Garage Band loops on mum’s laptop in the early of age of 10. Four years later he quit his piano lessons and switched to Machine and Ableton. Over the following years he improved his production skills and did some unofficial remixes from Gnarls Barley, John Milk & Dillon. 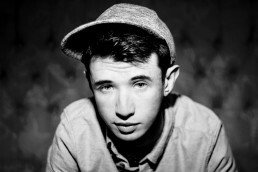 His wide musical interests crosses genres from drum & bass, glitch hop, house, hip hop, downtempo to freestyle electronica. After finishing high school, he’s now uninhibitedly commiting himself to music production.